Long Island will be the site as the Jets (4-6-1) visit the New York Islanders (3-4-2) and their starting goalie and ex-San Jose Shark netmidner Evgeni Nabokov. Nabokov was the center of controversy last season as the Islanders picked the exiled Russian goalie off waivers from the Detroit Red Wings only to have him not play due to him having no desire to play for the lowly Islanders. However, Nabokov is back in the NHL this season with the Islanders and so far is 1-2-0 with a 2.23 goals against average and a .927 save percentage. With numbers like those with only a 1-2-0 record - it shows how badly the Islanders need scoring and have struggled this season. The Isles are the lowest scoring team in the NHL with only 18 goals this season through nine games. The next closest teams in goals for are the Calgary Flames, Detroit Red Wings, Minnesota Wild, and New Jersey Devils - who all have 23 goals in ten or more games. Leading the way for the Isles is franchise player John Tavares as well as Matt Moulson, Mark Streit, and ex-Manitoba Moose star Michael Grabner. For the Jets, their defensive core is still underdoing some injury woes as Tobias Enstrom flew back to Winnipeg after taking a vicious hit by Panthers forward Jack Skille on Monday. He will not rejoin the Jets on the remainder of the road trip. Enstrom has six points (one goal, five assists) in eleven games thus far this season. Also out for the Jets on defense are Ron Hainsey, Derek Meech, and possibly Mark Stuart - who is day-to-day with an upper body issue. Stuart is being re-evaluated and is not a likely possibility to be in the lineup come game time at Nassau Coliseum. The Jets re-called defensemen Brett Festerling and Mark Flood from the AHL's St. John's Ice Caps this week to plug the holes on their defense. It is expected that both will be in the lineup for the Jets tonight on Long Island. Among the hottest Jets in the lineup is Evander Kane, who has six points (four goals, two assists) in his last five games after starting the season off without a point in his first five games. Alexander Burmistrov had his six game point streak snapped in Tampa Bay last Saturday and wasn't able to start a new point streak on Monday in Sunrise. The young Russian forward has nine points (three goals, six assists) in eleven games. On this road trip, starting goalie Ondrej Pavelec is 2-1-0 so far with a 4.00 goals against average and a .909 save percentage. 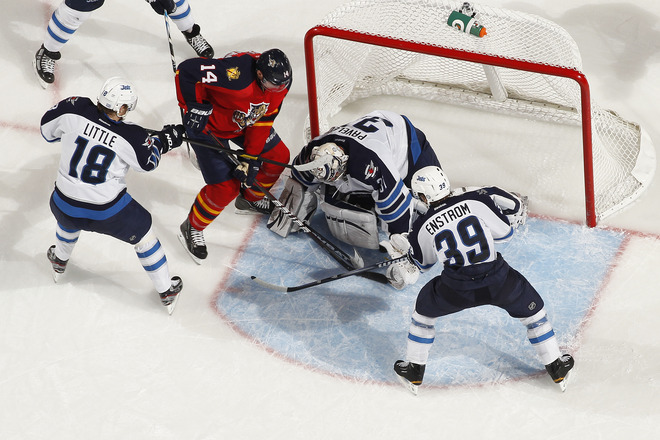 Pavelec is 1-1 in his last two starts in Florida with a 1.92 goals against average and a .946 save percentage. He has stopped 101 of his last 112 shots in the last three games. Game time is 6:00 PM CT and is available on TSN-Jets and TSN1290.